One problem that every road cyclist encounters at least once is a dropped chain. This little mishap could cause you to wreck, cut a groove into your expensive carbon fiber frame, and most likely it will happen at the worst possible time, like while attacking on the last hill of a bike race. The worst part is, it’s hard to prevent. Even with a properly adjusted front derailleur and years of perfecting a smooth shifting technique, it can still happen! There are a few products on the market (called “chain watchers”) designed to prevent the chain from dropping off the small ring, but these don’t fit all frames. If you have a fancy carbon frame, chances are that none of these gadgets will fit around the seat tube! So what do you do? You have to make your own, just like the pro mechanics do. If you look around the cycling news sites, you’ll find custom-made chain catchers on the bikes of Paolo Bettini, Alessandro Ballan, and the Liquigas team. If you want to make one yourself based on those images, more power to you. But I wanted to save a little bit of time, so I bought instructions on how to do it for $3.99, and that included diagrams showing exactly how to bend some steel to make one of these gadgets! The guide I bought was called “How to Make a Chain Catcher” and it was written by John Marsh. 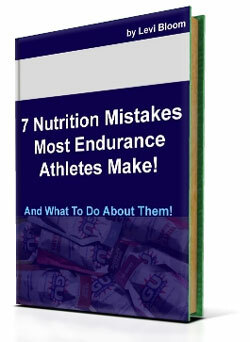 It is an 11-page eArticle that includes instructions, diagrams, and pictures. The idea is to make one of these custom chain catchers that will attach to the front derailleur braze-on mount. My mechanic skills aren’t too shabby, so I thought I’d just take on this task without help, but decided I’d buy this eArticle anyway to see how good it was. As it turns out, it’s awesome! It gives you instructions and pictures of the entire process. And the process only requires basic tools that most home workshops have. No welding or machining required. I’m glad I bought this because it gives you the exact dimensions you need. 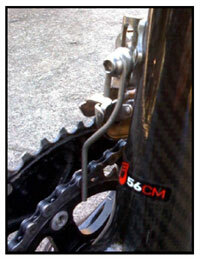 For example, if you look at the picture of a pro’s bike, you see you have to bend the metal. But at what angle? And how wide should it be? You could figure it out with trial and error, but I’d much rather pay the $3.99 and cut down on the trial and error! The only downside with this design (compared to some of the pro’s) is that the round metal will take up quite a bit of “thread space” on the Allen bolt that holds the front derailleur in place. But if that turned out to be a problem for you, you could shave down the steel rod or possibly use thinner steel. The article is fun to read and addresses a serious problem. A decent mechanic or handyman could make one of these without buying the instructions, but if you are slightly unsure how to do so, it would save you lots of time to just buy this for $3.99. Considering $4 or the article and $2 for the metal, you still save money vs buying a pre-made chain watcher for $10-15. So if you need one of these chain catchers, take a look at this guide.